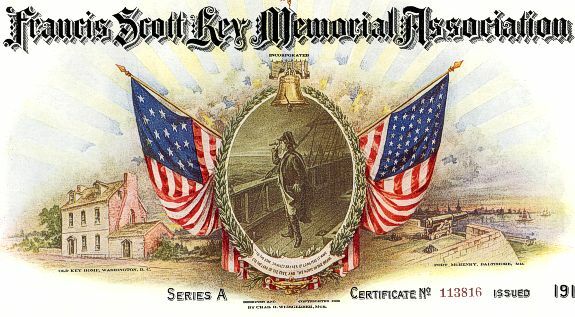 Beautiful certificate from the Francis Scott Key Memorial Association printed in 1911. This historic document has a vignette of Francis Scott Key between two American flags and the Old Key Home in Washington, D.C. and Fort McHenry in Baltimore, MD in the background. 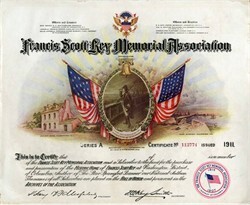 This item has the printed signatures of the Association's President( Honorable Henry R. F. MacFarland ) and Secretary ( F.S. Key Smith ) and is over 106 years old. Overall Fine condition. The subscriber's name not filled in.